Bradford Salem v Brods' Andy Clay scoring. 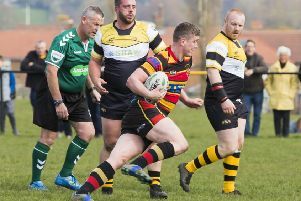 Brods made it four wins on the spin, after losing their Yorkshire One opener at Bridlington, with a 31-15 win at Bradford Salem on Saturday. A maximum five point haul keeps them third in the table. In excellent conditions at Heaton, Salem kicked off and immediately applied pressure. Brods defended well and George Ashton took a scrum against the head under the visitors’ posts. However, Salem would not be denied and their speedy backs linked well for Nick Fontaine on the right wing to touch down. The try was converted by Danny Belcher and Salem led 7-0 after five minutes. Salem dominated the early possession and Matt Hoyle and Tom Wilson had to combine well in defence. Brods gradually gained territory with Laurie Hamer making some strong carries. Lock Matt Willis was in support and he finished strongly under the posts. Ollie Akroyd converted to make it 7-7. The Woodhead boys were taking control of the scrums and lineouts and on 34 minutes they asserted their authority with a terrific drive from a scrum five metres out. Salem were shunted back over their own line and Rob Jennings touched down. Akroyd’s kick gave Brods a 14-7 lead. Outstanding young prop Reece Ward left the field with an ankle injury and the scrum seemed to suffer as Brods conceded a penalty, which Belcher converted from half way. Half time arrived with only four points between the sides. Brods opened the second half with some terrific handling. Hamer again featured with a powerful run in midfield and the supporting Andy Clay’s immediate pass put full-back Hoyle in at the corner. However, the touch judge’s flag went up for a toe in touch. Brods continued to control the game with some powerful drives from the forwards in midfield and the backs linking well. With Salem reduced to 14 men following a yellow card for a high tackle, Brods turned the screw when a scrum was awarded 10 metres from the Salem line. Luke Scrimshaw had entered the fray at No 8 and took his opportunity behind a dominant pack to touch down. Akroyd converted and the 21-10 score line reflected Brods’ superiority. The bonus point try came on 64 minutes when Clay ghosted through to finish a well worked move involving Brods half-backs Chris Vine and Phil Town . Brods appeared to take their foot off the gas and Salem immediately took advantage with another good try finished by Fontaine. Salem continued to press but when Akroyd kicked deep into Salem territory, young winger Wilson motored past his opposite number, gathered the ball and dived in at the corner. A spectacular final act. Brods seconds enjoyed another good win at home to their Salem counterparts.